George Bush says Karl Rove is protected under Executive Privilege and orders him not to testify before Congress, despite -- or maybe because of -- a subpoena he received last week. So Rove's aide shows up and ducks all the questions on his behalf. The BBC says British troops are stressed out. More than 1500 "Liberal bloggers" are expected for the second annual YearlyKos Convention. The press and seven of the eight declared Democratic candidates will be there. Joe Biden and I will be elsewhere. The South African cricketers are getting set for a visit to Pakistan but nervous about security and asking for the list of venues to be reviewed. "They are not comfortable with Peshawar," PCB [Pakistan Cricket Board] sources said. Australia's A side are due to visit Pakistan in September. If the South Africans are nervous about security, what must the Australians be thinking? Hint: How many South African troops are involved in the GWOT? With Donald H. Rumsfeld seated at the witness table, the chairman of a House committee investigating the bungled aftermath of the friendly fire death of Cpl. Pat Tillman told a packed Capitol Hill hearing room Wednesday that the time had come for some answers. What did Mr. Rumsfeld and other top Defense Department officials know about Corporal Tillman’s accidental killing by American forces, he asked, and when did they know it? They're still trying to unravel the coverup, and asking "Who knew what when?" But no attention at all is paid to the central question: What happened to Pat Tillman? This is the standard operating procedure, exactly what the media -- even much of the supposedly dissident media -- have done since Tillman's murder. Damned "Liberal media." Larisa Alexandrovna reports that the Bush administration has been covertly arming Gulf states since 2004. The administration has also kept secret a court ruling that its illegal surveillance program is illegal. Bush has declared a state of emergency based on some unspecified threat to the government of Lebanon and claimed even more anti-Constitutional powers. A Marine has been convicted of murder in Iraq. USA Today has yet another appalling human-interest propaganda piece. 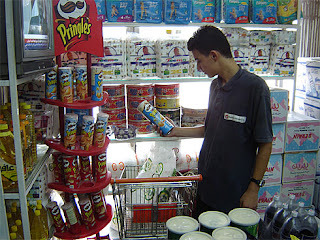 When Steve Yelda, a 17-year-old Iraqi high school student, visits the Al-Ameer market, he heads straight for the Pringles display case. "The taste," Yelda said, "is incredible." Watch out for all the salt, Steve. 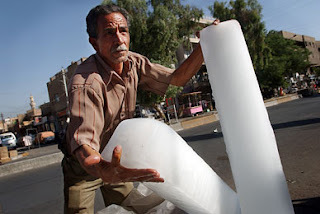 In Baghdad there's no running water, or very little; some people have had none for weeks; they have electricity a couple of hours a day if they're lucky; daytime temperatures have been approaching 50C (120F) and the search for ice has become deadly. In perhaps the biggest surprise of all, Feds Look the Other Way While United Fruit Company Peddles Death and Corruption in Latin America. As Chris Floyd points out, this story "could have been written any time in the last 100 years or more". This -- all this! -- is the fruit of our hard-earned tax dollars at work, not to mention a broken electoral system, a corrupted congress, a predisposed supreme court, a lapdog media, a touch of transparently false-flag terror and an endless repetition of the emergency phone number "coincidentally" embodied in the date of same; and it's all brought to you by an administration whose nature is becoming increasingly obvious every day, even to those who are, shall we say, less sensitive to such things than others. But still life goes on, almost as normal. And all the people trapped in the lies seem like they'll be happy to replicate the fiction forever, or until it consumes them. We all know which will come first. Meanwhile the people shedding the lies seem like they'll be unhappy forever, or until something else finally comes along and consumes them. We're going to find out more about this soon ... too soon, in my opinion. Last but certainly not least, signs of serious trouble have been appearing in several crucial nodes of the blogosphere.